In our hyper-competitive world, every manufacturer would like to increase production and quality while improving efficiency. Automation can do all of these things, but most factories don’t pursue the possibility, especially small and midsize operations. There are all sorts of reasons; Fear of blowing the budget often eclipses the fear of falling behind; Introducing automation can be costly; Additional staff has to be hired or trained; Designing and implementing an automation system can be difficult. Even determining exactly how automation can help productivity and quality requires time and careful examination. All of these barriers can prevent companies from taking the crucial step toward being more competitive. 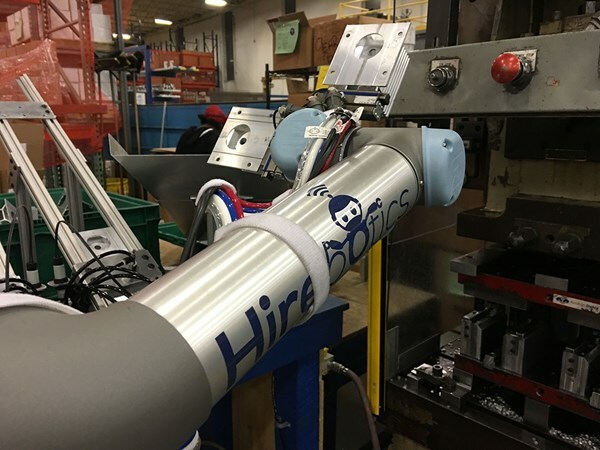 A company now eliminating those barriers offering UR robots as temporary workers is Hirebotics focused on improving the manufacturing process while making the factory more productive. 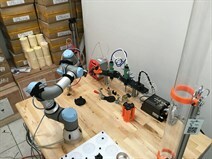 The company has developed a suite of standardized, modular robots for a variety of different applications including machine tending, sheet metal work, packaging, and assembly, a modular approach that allows quick deployment of the robots. From the time Hirebotics finalizes a plan to the time the first robots are deployed is usually four to six weeks. The robots are cloud connected which grants them the ability to monitor their performance in real-time and expose data back to the user in a mobile app such as production or quality data that the robot is collecting. Some examples of the data that is available to customers: the number of parts produced over any time period, the cycle time between parts, diagnostics data about the robot, and in some cases the diagnostic data of the equipment the robots are using. In most cases, the only limiting factor in what is collected and displayed is your imagination. Hirebotics’ automation experts will visit your facility to work closely with the operations team. Together they will examine your process and determine where automation will have the strongest impact to make your factory more competitive on the world stage. Hirebotics will then design a comprehensive automation solution featuring state of the art robots from Universal Robots that will be installed and monitored 24 hours a day, providing you with access to all of the production data. All with no upfront costs to you. You simply pay for the robot as if it were another employee. Since you are only charged for the hours that the robots are productive, Hirebotics share the same goals. The more work Hirebotics can help you complete, the better off both companies are. Hirebotics uses Universal Robots in the design and implementation of the robotic workers because of their inherent safety and the ability to set the robots up to work in close proximity to your human workers. By utilizing the advanced collaborative features of the robot they are able to achieve more by having humans and robots collaborate with each other. Studies have shown that human/robot collaboration generally yields higher productivity than either can reach alone. The reason for this is simple, you get the best of both worlds when you allow the robots and the humans do what they excel at. While humans are great at cognitive tasks, or tasks that require dexterity or vision, robots excel at monotonous tasks, repetitive tasks, high precision tasks. By using both together, your human workers will have a higher job satisfaction and let’s face it, the robot never gets bored. Expanding the workday, robot workers can often be designed to complete tasks while unattended at night, gaining additional hours of productive work every single day. Explore a world of real-time insight into how well your factory is operating. The mobile app dashboards give you access to data when you want it. See what is happening on your factory floor right now instead of seeing today’s production reports tomorrow. The system can alert you to prevent a potential problem from becoming a real problem. If the planned hourly production is 200 parts per hour, set a trigger to alert you if the rate drops. The system operates in real-time, alerting you and allowing you to make corrections. You can even have your robots talk to you through the app, are there events that occur that you want to know about such as being without work for a specified time limit, or when there is a quality issue with the parts. 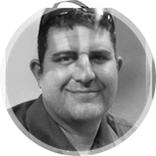 Matthew Bush has 20 years of experience in operations management and engineering in a wide variety of manufacturing environments including both continuous and discrete processes. Prior to co-founding Hirebotics, Matthew was the Director of Operations for SFEG, a Berkshire Hathaway company. In that role he was responsible for procuring and overseeing the installation of a number of Universal Robots. Along with his partner, Rob Goldiez, Hirebotics was founded at the end of 2015 with the goal of making robotic automation easier than hiring a person. Hirebotics focuses on robots as cloud connected, for-hire robotic workers. Matthew has a BS Mechanical Engineering and MBA from the University of Florida and a MA in Industrial Technology from the University of Northern Iowa.